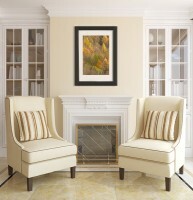 Having chosen your artwork, you may find yourself with the dilema of which location to choose to hang it. It can be difficult to envisage how it will look in a particular room, or with existing furniture or décor. That's where Virtual Room Service comes to the rescue. Simply send me a photograph of the space and I will superimpose your chosen artwork into your room. This allows you to evaluate a variety of images, sizes or locations. Email us a good quality, well lit photograph, taken head on to the intended space. Include measurements for something in the picture i.e. a chair height or table length. This will allow us to scale the virtual artwork appropriately. If you intend to frame the piece let us know the preferred frame type i.e. light/dark wood, silver etc and we will add a generic frame to further enhance the virtual design concept. In order to keep this service viable, we request that you use up to a maximum of 5 different layouts.